I've been haunting my quilt reference books for just the right block and technique to make for my 8" center block for the Spring Fling Round Robin. 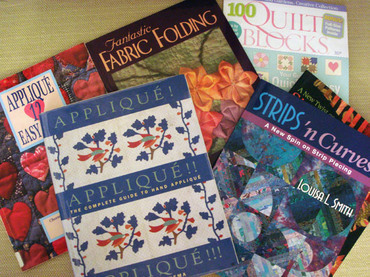 At first I thought that I'd like to do applique and Susan of Desert Sky Quilting recommended some good books which I then ordered from Amazon. (They're old library books.) Then I looked at the quilt books again and kept seeing the one on fabric origami. That looks intriguing so I thought that it'd be interesting if I took a traditional block with a center square and made that using the origami technique. So I'm flipping through the Better Homes and Gardens special publication of 100 Quilt Blocks trying to find just the right block. There's also the amazing online resource by Marcia Hohn, Quilter's Cache.